Jade is the youngest member of the team. He graduated in 2015 after completing 3 years of study along with 18 months of practice study with ADG under the guidance of Senior Designer, Trevor Jones. 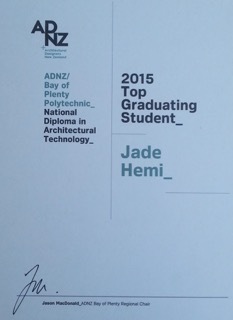 In recognition of graduating as top student, ADNZ awarded Jade a stunning book by Claire McCall "Green Modern - Eco-Conscious Contemporary New Zealand Homes". Jade's interest for architecture began in high school where he took the creative courses of Graphics, Art and Design. "I enjoy designing, finding the commercial very technical and challenging. The residential is rewarding as a design comes together which encapsulates the client's vision".